As of late, I have been writing a few current players for their autographs and while my dislike of the Colts has almost reached epic proportions on occasion, I still respect them immensely for the success they have had on the field- sans 2011. Case in point and de facto franchise MVP, I present to you: Peyton Manning. Born into good bloodlines (his father Archie was a QB for the Saints and his younger brother Eli plays for the Giants,) Peyton Manning was a poised and professional grade quarterback coming out of college from the University of Tennessee in 1998. At the time of his graduation, Peyton held virtually all Volunteer passing records, and set an SEC mark for wins with 39. A debate shortly raged over if the Colts would pick Manning or Ryan Leaf with the #1 in the draft, but in the end Manning was Indanapolis’ guy, replacing departed Jim Harbaugh at quarterback. His rookie season saw a multitude of records, including most touchdown passes and attempts for a rookie, however it would be punctuated by a 3-13 record and his league leading 28 interceptions. Manning responded with a brilliant Sophomore campaign, leading the Colts back into the playoffs and also posting his first 4,000 yard season of his career, – a milestone considering he’d repeat the feat for 5 straight seasons after 1999. In 2003, Peyton earned his first MVP honor, leading the NFL in attempts, completion percentage and yards. Manning threw for a then record 49 touchdown passes, in 2004 earning his second straight MVP title and a 121.1 passer rating. It’d be finally in 2006, that Peyton garnered the elusive Super Bowl title he was after, as the Colts easily dispatched the Bears in 29-17 in SuperBowl XLI. Peyton earned the MVP honors with 28 of 35 passing for 247 yards and a touchdown. He’d pick up again where he left off with his 7th 4000 yard season, continuing his assault on the record books with 4000 yards in each of the next 4 seasons, winning MVP honors a 3rd time for his 2008 performance and a 4th time in 2009 where the team returned to the Super Bowl but lost to the New Orleans Saints. Unfortunately Peyton’s 2011 came to a thudding end before it even began, at 208 regular season starts (second only to Brett Favre), as it was revealed that Peyton was suffering from various debilitating neck and back injuries, which have put his career on hold. 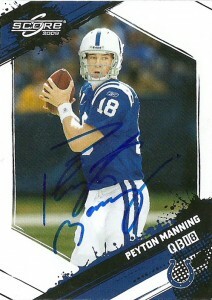 Manning holds virtually all the Colts passing records, and many NFL records. An 11 time Pro Bowler, 5 time AP, 2005 Pro Bowl MVP, and member of the NFL 2000 All- Team team, Peyton becomes a shining jewel in my collection and his historical legacy, virtual shoe-in status for the HoF, and impact can not be overlooked in the annuls of NFL history. Although Manning’s team is considered a bitter rival, no opponent should have their career ended by injury, and thus I wish him a speedy recovery so that the Colts and the Texans may do battle again. I had heard that Peyton was a difficult autograph to attain TTM prior to 2010, however Manning has been graciously signing this year for fans through his Peyback Foundation. I was astounded to get his autograph in the mail- free of charge and in roughly 10 days. I am a big fan of Score 2009 and really like the design that they put into these cards. Although they lost some of that magic again by their 2011 set, 2009 stands as an inspirational and cutting edge look that really highlights how far the company has come in 20 years.